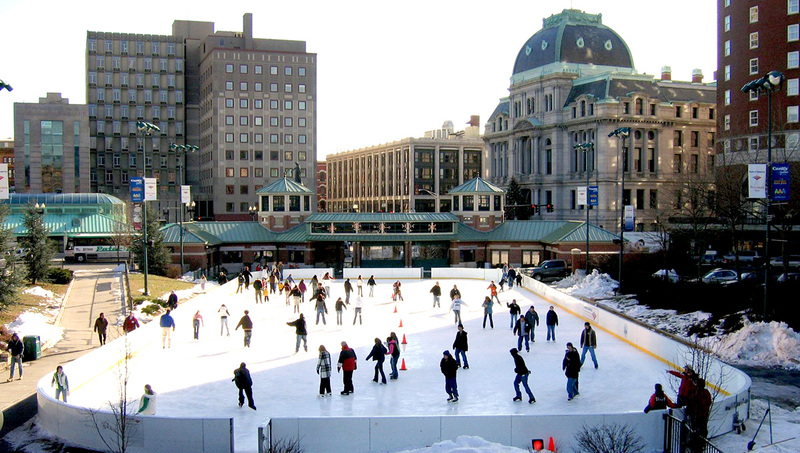 The Providence Rink will be open for ice skating season starting on Saturday, November 15th at 10:00am. Regular hours of operation during the week are Monday through Friday, 10am until 10pm and new hours for Saturdays and Sundays are 10am until 10pm. The Rink is open on all winter holidays. General admission is $7 for adults, $4 for seniors, $4 for children (12 and under), and $4 for military. Skate rentals are $5 and skate sharpening is $7. Season passes are available and priced as $90 for an adult, $200 family of four, $50 children and seniors. Special rates are available for birthday parties, school groups, business and social groups, and for full ice rental for private events. Visit www.providencerink.com for details and to make your reservations. Learn to Skate this season with our in-house instructors who can schedule private lessons when it is convenient for you. Special rates are offered weekly during the season including our new FUNday Mondays! for children 12 and under. Rhode Island PBS is the FUNday Mondays! sponsor for the month of December. Please note that our specials do not apply during school vacation. FUNday Mondays! Mondays from 2:00pm to 6:00pm admission for children 12 and under is $2 ($2 off regular admission) and skate rental is $5. The heated pavilion will be open for kids programming. College Night, every Wednesday from 6 pm until 10pm. Admission for college students is $5 with a valid college photo ID and skate rental is $5. Lunchtime Special, every weekday from 12noon until 2 pm. Admission is $5 and skate rentals is $5. After-Work Special, every weekday from 4 pm until 6 pm. Admission is $5 and skate rentals are $5. RI Community Food Bank food drive runs from Saturday, December 15th to Sunday, December 23rd. Bring in a canned good and receive a coupon for $1 off admission your next visit. Tree Lighting, December 6th from 5:30 to 7:15pm. The ice will be closed for public skating during the event and will reopen by 7:30pm. Toys for Tots toy drive, December 1st to December 10th. Bring a toy and receive a tasty treat from our rink-side Subway. Toys must be new – no need for wrapping paper.